Lynne's Gifts From the Heart: Pink Saturday All Spooned Up!! Pink Saturday All Spooned Up!! http://howsweetthesound.typepad.com/myweblog/.com. Once there you'll find a wonderful world of pink. 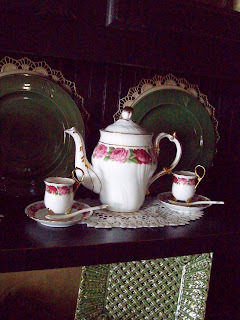 A few weeks ago while I was changing a few things up around here I pulled out yet another tea set. Yes, girls I believe I've gone nuts over tea sets. I have quite a few of them. lol. 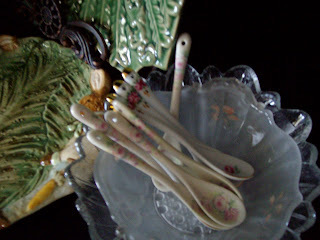 The antique bowl laced with pink roses was found many years ago. Quite honestly I can't remember where I found it.. lol.. I decided to fill it full of small tea spoons decorated with more beautiful pink roses. What a precious tea set, Lynne! You have such an eye for displaying your beautiful pieces. Love all those cute little spoons! Susan P.S. Love your header pic...soooo nostalgic! :-) Beautiful! I just love this one with the delicate roses and the cute spoons. Did you save me a brownie? I need one right about now. Have a wonderful weekend my friend. I hope the weather is lovely. Thank you for all your lovely comments that you leave for me on my blog. I actually have pink cupcakes for Beverly's Pink Party that would match your teaset perfectly. I will be posting it in a few hours. Wouldn't it be nice if we could have afternoon tea together one day. Hi, Lynne! I love that tea set! I have a few myself! Now those little tea spoons are the most precious things I've ever seen! Actually, I've never seen any like this and the dish! What do you not have!? ;) Just gorgeous, Dear One! Hi Lynne, Dahling...good ole Walmart! I love tea time! Your beautiful tea set would look beautiful in my house. Thanks for stopping by my blog and leaving a comment. I really appreciate it. I love your spoons. Are those china? Lauralu gave me an award that I am passing slong to you. You were one of the first to comment on my new blog and I SO appreciated it. Check it out at my place--thanks! I shamelessly admit to not owning a teaset. I see all of the beautiful photos you and others post and I have a new found love for them and want to start a collection. Love the spoons. I LOVE YOUR TEA SET...I LOVE THE TEA POT...IT IS UNIQUE AND THE ROSES ARE SO VERY BEAUTIFUL. My Grandson and I watched a Mom Swap and one of the Moms had a home based business where she brings young girls into her home for an afternoon tea and a lesson in manners. I thought how nice this would be, to get girls out of their jeans and into dresses and your lovely tea set made me remember this lady. This was way more information than you most likely wanted....have a smiley day! Lovely tea set! Happy Pink Saturday. What a pretty tea set, and love the spoons. Hope you are having a great weekend. Wonderful post! I love the spoons in the beautiful bowl. Lynne, lovely post! It is all just beautiful! Dear Lynne ... your pink is precious today. I only have one teapot and now I'm yearning for more AND matching spoons too. I love the Tea Sets! You can never have too many! That is like saying you could have too much Pink! Pink Saturday is so much fun for me and especially fun when sites like yours participate. Thanks so much for sharing with me today! I ♥ your blog! Oh that tea set is to die for! I love it Love it LOVE IT! Your little dog on the side bar makes me smile every time I come visit still! He is so cute! Love your tea set. One can never have too many tea sets. Have a wonderful weekend. Love & blessings from NC! Beautiful handles and pretty flowers on that tea set! Have a grand weekend. Honeycombmama, thanks so much for the visit. I've tried to respond to you on your blog, but it's by invitation only. I'm so glad you stopped by, hope to see you again soon. Have a super w/k. 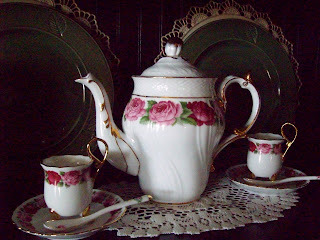 I just love your pink rose tea pot, and teacups! It is so lovely!!! The lace so pretty with it! Oh, how I love the rose spoons! I have never seen any like them! Oh, how I wish I could find a set of spoons! Are they new??????? If so where can I find them???? I have fallen in love again! lol Hope you and Hubby are doing great! I got to go shopping about six times this month! For someone that near never left the house in 3 years! I have had so much fun! After shopping one night, Hubby and I went fishing! I never liked to fish, but it was so fun. We were back in the old days at our favorite places. I have bought so much. I went yesterday to My granddaughter's third Birthday Party. She was so excited with her table and chairs, for she also got a stove with dishes and another tea set and a Kettle! Love your pink rose set! Loved your tea set! Who can resist roses? Not me! The spoons are adorable too. Such an adorable tea set! Do you possibly have a secret to storing goodies like this. Every cupboard of mine is stuffed..yes, yes, I need to have a garage sale...but...I just cannot let go of many of my goodies yet. Any ideas? First, I love your new header photo...awesome photo! I also love your teaset, beautiful china and what a great color combo!